We are happy to announce the immensely popular Cyanotype workshop is back and will be run by South Wales University lecturer Andy Pearsall. We have listened to your comments and given you more time on the Saturday to experience the capturing and printing of these beautiful cyan – blue images . 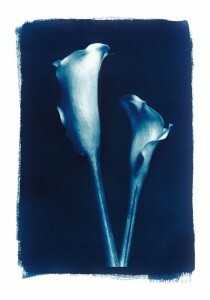 The cyanotype was discovered by John Herschal in 1842 and popularized by Anna Atkins 1799 – 1871. The botanist used the process to record her botanical specimens. Join Andy and step back into history on this fascinating workshop.